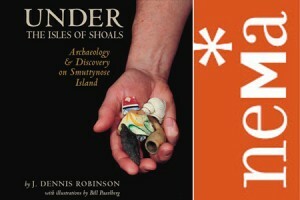 Under the Isles of Shoals wins second place in the NEMA Publication Award Competition! We are proud to announce that Under the Isles of Shoals: Archaeology and Discovery on Smuttynose Island published by the Portsmouth Marine Society and designed by Grace Peirce (Great Life Press) has won second place at the New England Museum Association Publication Award Competition. Written by popular local historian J. Dennis Robinson the book beat out 167 other entrants to gain one of the top honors. The book launch complemented an exhibit with the same name at Discover Portsmouth during the 2012 season which drew tens of thousands of visitors. 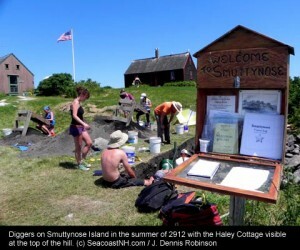 Under the Isles of Shoals: Archaeology and Discovery on Smuttynose Island looks at the archaeology of a small island ten miles off the coast of Portsmouth, New Hampshire. Historian and author J. Dennis Robinson (seacoastnh.com) demonstrates the island’s dynamic and storied past that has captured the imagination of New Hampshire residents and visitors alike. The book follows the four year dig by archaeologist Nathan Hamilton as he and a team of students delve into the 6,000 year history found in the thin island soils. Full of vibrant color photographs, new evidence unearthed by the dig adds to the rich history of this fabled island. Copies are available at the Discover Portsmouth Museum Shop located at 10 Middle Street in Portsmouth, New Hampshire, open from 10-5PM daily. The book can also be ordered online from Enfield Distribution. Shoals Archaeology exhibit: Only a few more days to go! Only a few more days to go to see the “Under the Isles of Shoals” exhibit at the Discover Portsmouth Center in downtown Portsmouth, NH. 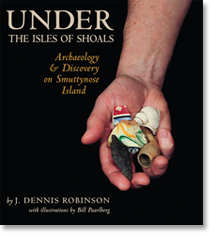 If you miss the exhibit, be sure to stop in at the Discover Portsmouth Center anyways, and pick up a copy of J. Dennis Robinson‘s great book, Under the Isles of Shoals, designed and produced by Grace Peirce of Great Life Press. The book is available at the Discover Portsmouth Center, and also can be ordered through the Portsmouth Marine Society, where you can also find many other fine books on the history of the maritime region of the Piscataqua River, which runs between New Hampshire and Maine. The Under the Isles of Shoals book has over 200 full color photos and maps, illustrating the well-written account of the archaeology dig now in progress on Smuttynose Island off the coast of New Hampshire and Maine. Thousands of artifacts are being uncovered. “In just four years of an ongoing “dig” at the Isles of Shoals, Nathan Hamilton and his archaeology students have unearthed 250,000 artifacts. Those bones, stones, and fragments of human occupation tell volumes about life on a rock. And tiny buried shells may reveal secrets of climate change.” — J. Dennis Robinson. Read more: What We are Learning about the Isles of Shoals.